Ultra Protection is formulated to give your lips and extra high level of protection against the elements, with a light feel that’s comfortable to apply. Ultra Protection provides 6 protectants to defend your lips from nature’s drying forces in any season, reducing the effects of cold, wind and sun. SPF 30 - Provides 30 times your natural protection against burning. Keeps the lips moist and has a very subtle taste. I use it all the time! I do not like the ingredients. It did not taste good to me. I liked that it had a higher SPF, which is good for the summer. It went on clear and not white, which is good. But for the price it is good. Need the higher 30 SPF in summer and for vacations. This one is great! I agree that it would be nice if it came in a twin pack. Loved the taste, texture, and SPF! Whenever I'm doing outdoor sports (skiing, etc.) 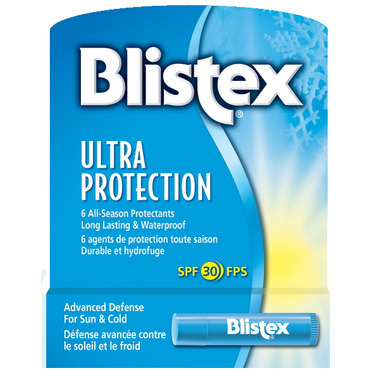 I keep a tube of Blistex 'Ultra' in my jacket. It protects my lips better than any other lip balm I've tried when exposed to sub-zero temperatures for extended periods. The extra SPF is great when outdoors during the summer/winter for extended periods. Unfortunately it is more pricey than the regular kind, and does not come in twin packs.